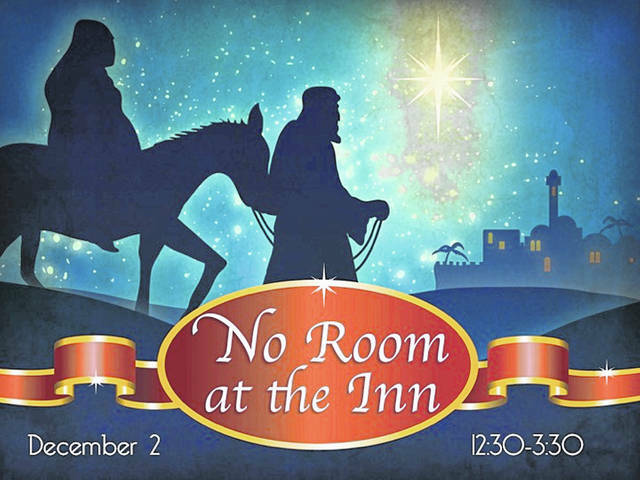 Messiah Lutheran Church, 1013 East Lawn Ave., will host “No Room at the Inn” on Dec. 2 from 12:30 to 3:30 p.m. The annual event exhibits hundreds of nativity sets from around the world. Live music will be presented in the sanctuary throughout the event. At 2 p.m., the Graham High School Show Choir will present a concert. Anyone wishing to lend nativity sets to the church for the event may do so Nov. 29 from 10 a.m. to noon or 6 to 8 p.m., Nov. 30 from 10 a.m. to noon or 6 to 8 p.m., or Dec. 1 from 11 a.m. to 1 p.m. Exhibitors do not need to be present on the day of the event. Nativities should be picked up after 3:30 p.m. on Dec. 2 or by special arrangement. There is no admission fee for the Dec. 2 event, however, donations will be accepted for the Caring Kitchen. A Christmas luncheon will be available for $5 for adults and $3 for children under 12. There also will be a silent auction. For more information, contact Mike Henson at 937-408-1517.